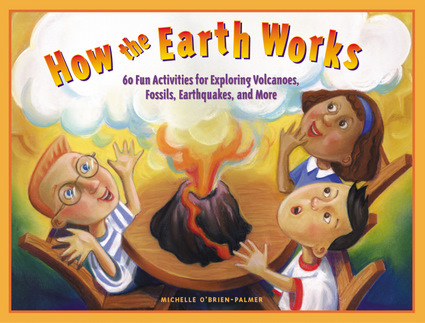 Earth science comes alive for children 6 to 9 through 60 engrossing games, activities, and experiments. Kids “core sample” a filled cupcake and discover plate tectonics by floating graham cracker continents on a molten mantle of molasses. They learn how heat changes rocks by seeing how separate ingredients disappear when they bake Rice Krispie Treats. More activities show what causes earthquakes and what kinds of buildings resist their force. Growing sugar and salt crystals, “fossilizing” plastic insects, and modeling a variety of volcanoes add to the learning and the fun. Eight of the activities are tasty as well as informative. Silly songs help children remember new words and concepts, and a resource section gives inexpensive sources for rocks, minerals, and fossils. All the projects have been tested in homes and schools to make sure they are safe, effective, and fun. Michelle O’Brien-Palmer is the author of Sense-Abilities, Healthy Me, Watch Me Grow, and several Scholastic teacher guides as well as other books. A science educator, consultant, and specialist in educational curriculum development, she lives in Seattle, Washington.